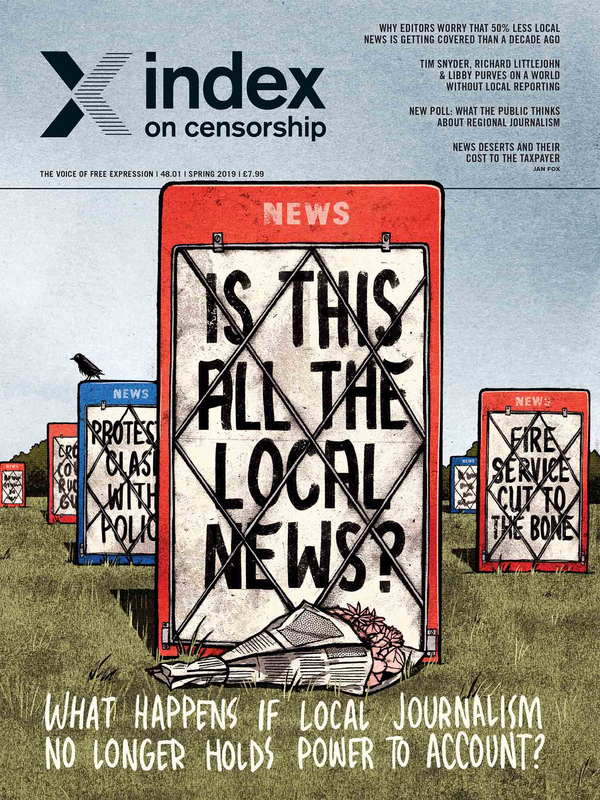 The spring 2019 Index on Censorship magazine looks at what happens when local newspapers disappear and decline. Who is there to hold politicians and lawmakers to account locally? In this issue successful journalists and writers Richard Littlejohn, Libby Purves, Andrew Morton and Julie Posetti describe how they began their careers in local news in the UK and Australia. The decline of local newspapers is a global phenomenon. Karoline Kan reports from China about how they are being squeezed out by Communist Party scrutiny; and Rituparna Chatterjee reports on the difficulties of satisfying the Indian appetite for local news. Jan Fox examines the USA's news deserts. Mark Frary digs into the latest artificial intelligence being used by local newspaper editors. In the rest of the magazine, Alessio Perrone looks at how Italy is stopping journalists reporting on refugees crossing the Mediterranean. We publish an original short story by historian and China expert Jeffrey Wasserstrom, plus an extract from the Slovak writer Michal Hvorecký’s latest novel, Troll.